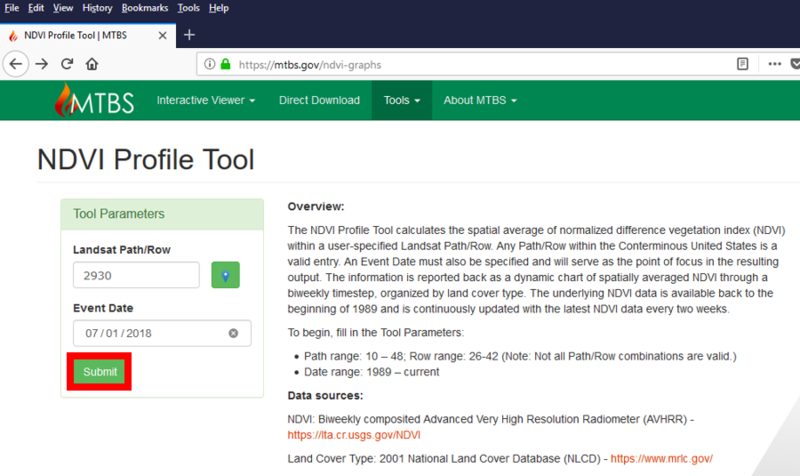 You can type in the four-digit Landsat Path/Row (if known). In this example "2930", Landsat Path/Row over Sioux Falls, SD, was typed in. Figure 1. 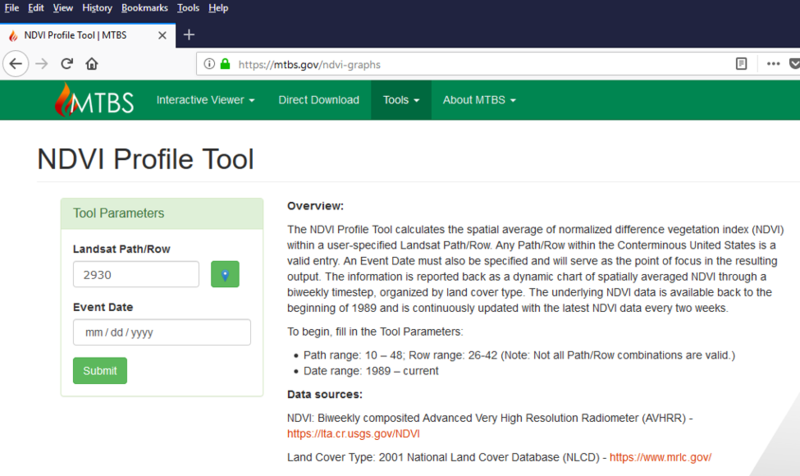 NDVI Tool Landsat Path Row Entry. Another option is to click on the map maker icon (highlighted in red). Figure 2. 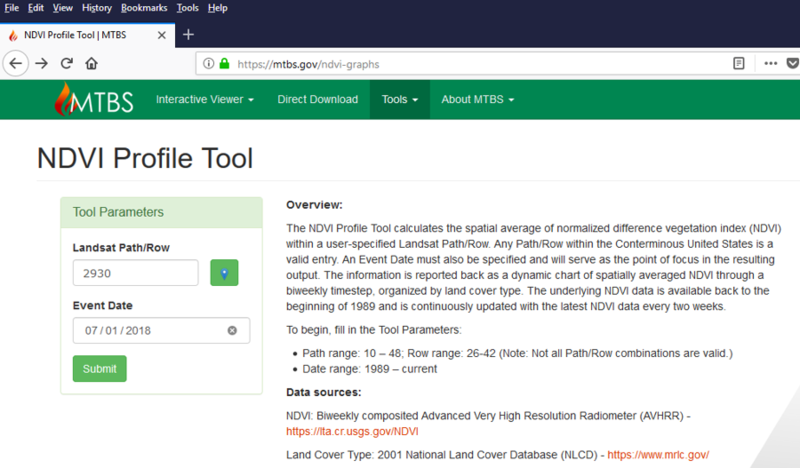 NDVI Tool Map Maker Icon. This will bring up a map. 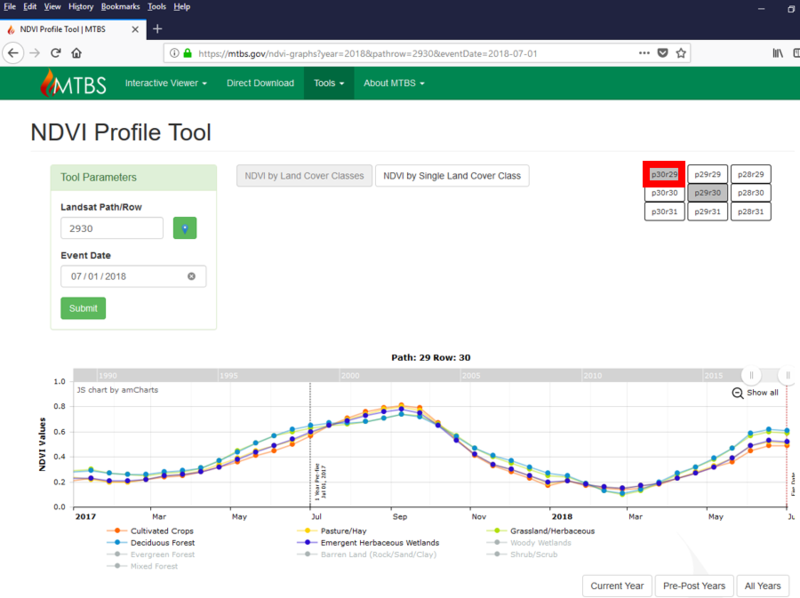 Click anywhere in the conterminous US, and the correct Path/Row will be added to the Landsat Path/Row box. In this example an area near Sioux Falls, SD was clicked on yielding the Landsat Path/Row "2930". Figure 3. 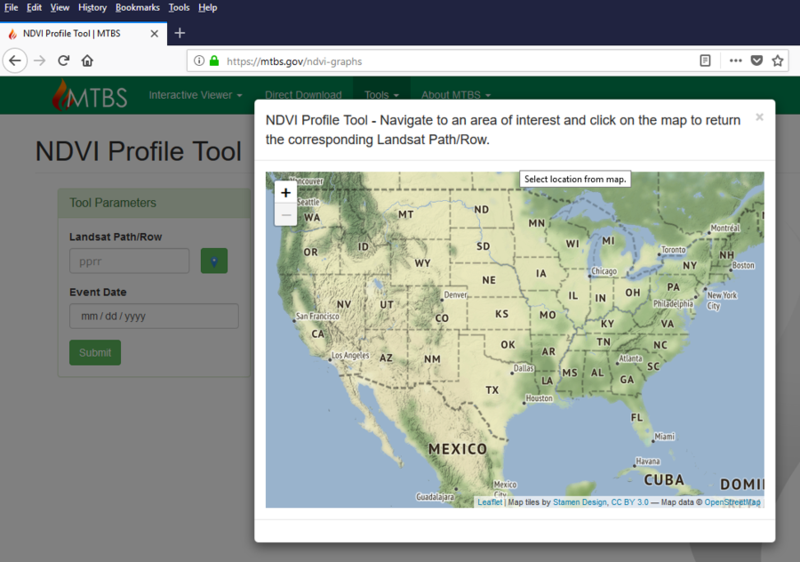 NDVI Tool Map Click to Select Landsat Path and Row. Figure 4. 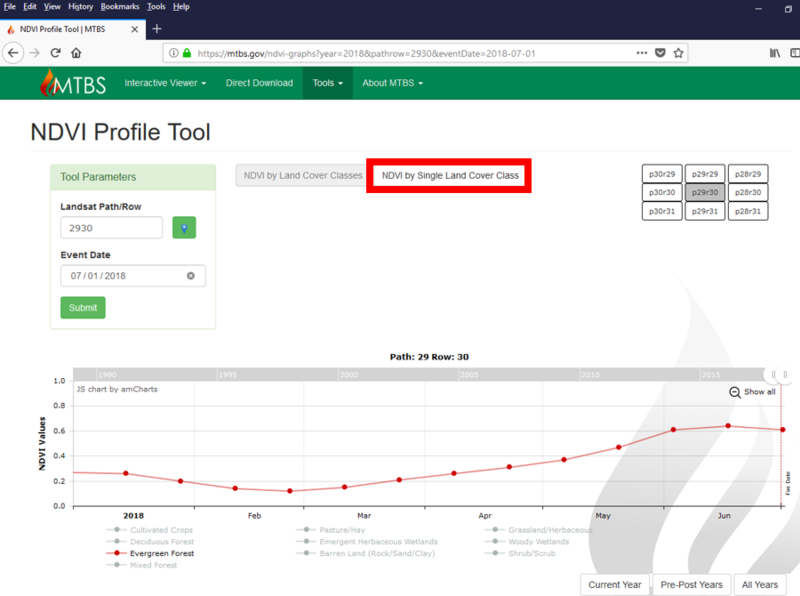 NDVI Tool Date Entry. In this example, we decided to use the date of 7/1/2018. Figure 6. 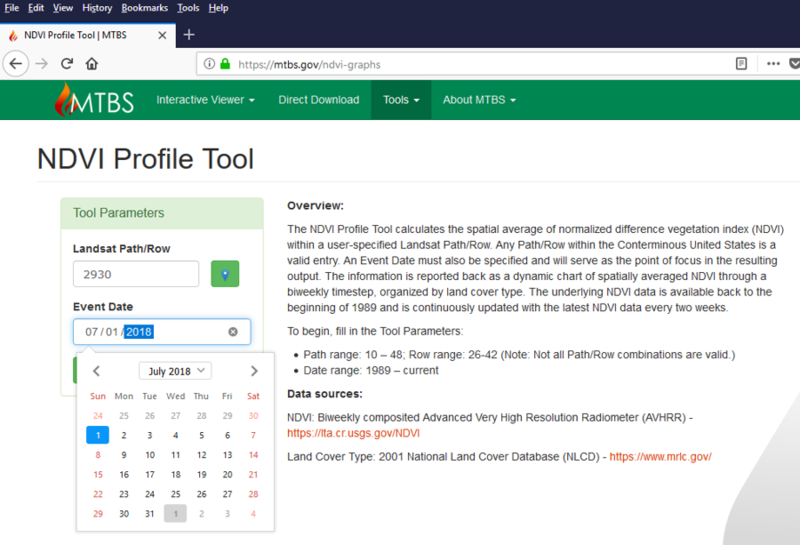 NDVI Tool Date Entry Example. Figure 7. 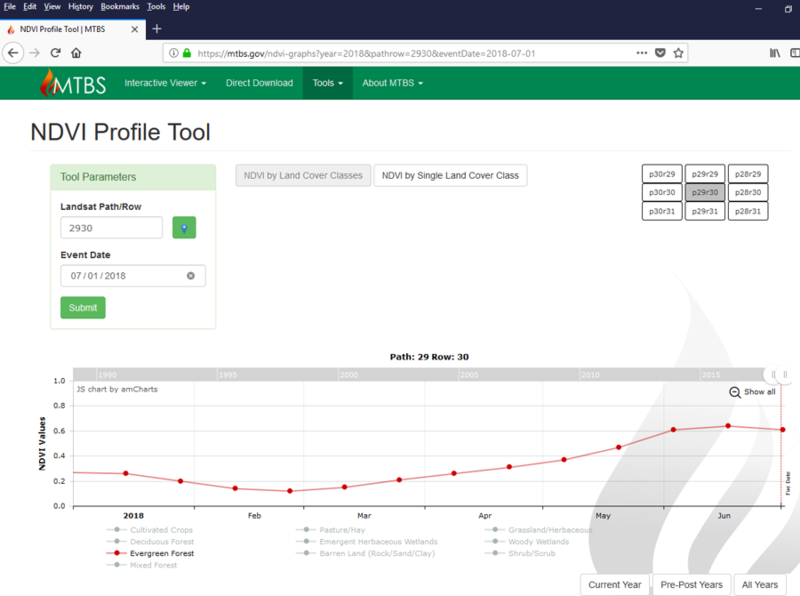 NDVI Tool Submit Button. 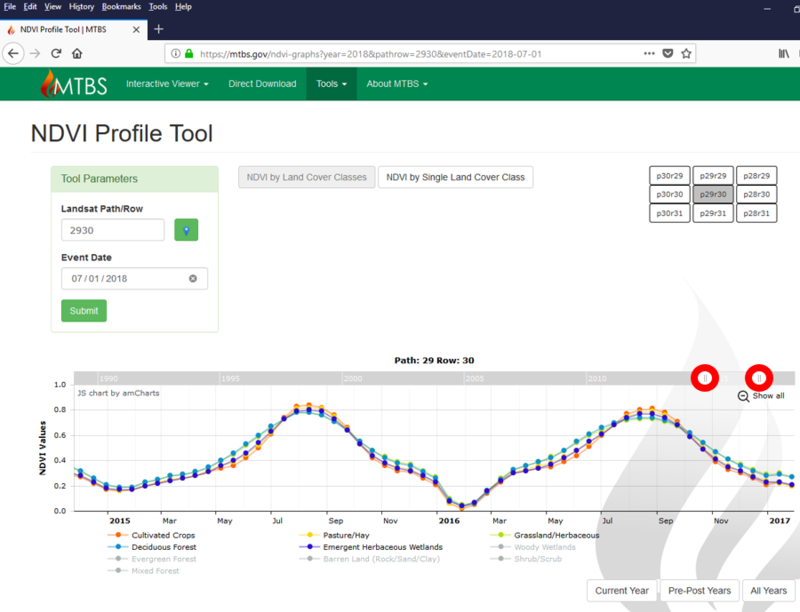 The NDVI graph with the 1-year pre-event and event image date will show on the graph. Note that the curve changes based on the vegetation that is being show. You could also just pick one vegetation type by clicking on the vegetation types that you don’t want to examine. 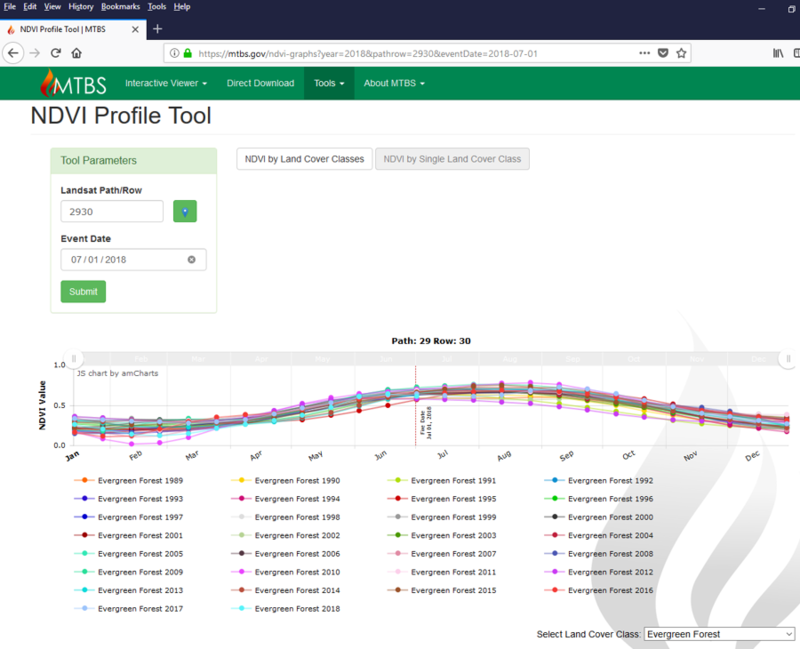 Selecting the NDVI Single Landcover class tab yields all years by one vegetation type. To show all years NDVI curves, click on "Show all" (highlighted in red). All vegetation curves between 1989 until the present will be shown. You can also move the date sliders (highlighted in red) to display NDVI data by a specific date range. 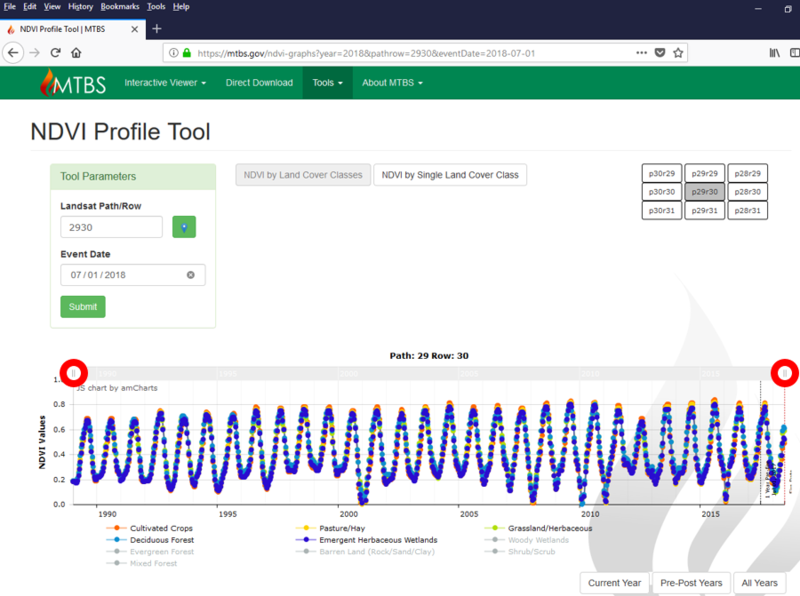 In this example we moved the left date slider to 2015 and the right date slider to 2017 to display the 2015-2017 NDVI data. 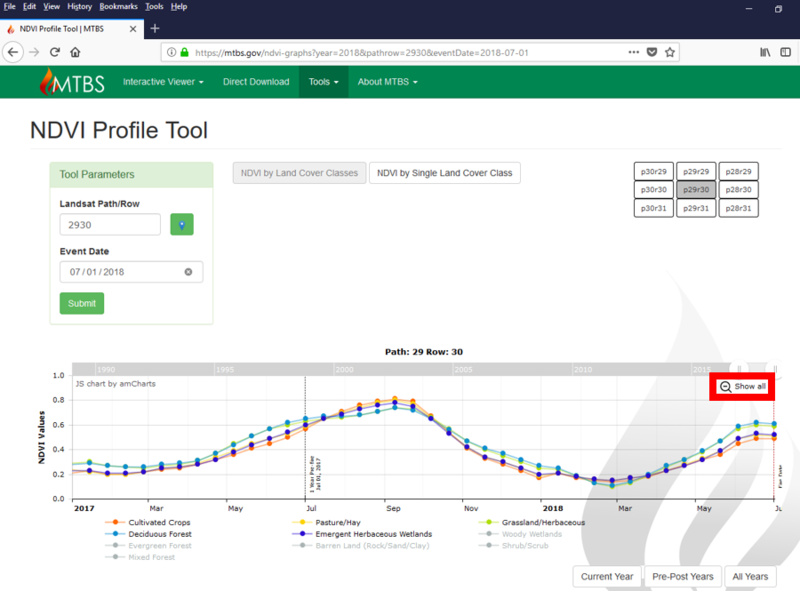 To look at the NDVI curves of adjacent Path/Rows, you can click on any of the six surrounding Path/Rows. 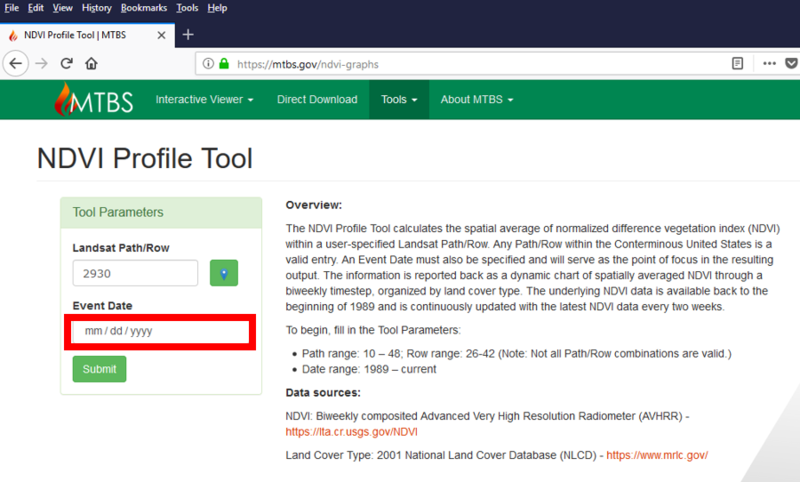 In this example we will examine the NDVI graph for Path 30/Row 29 (highlighted in red). 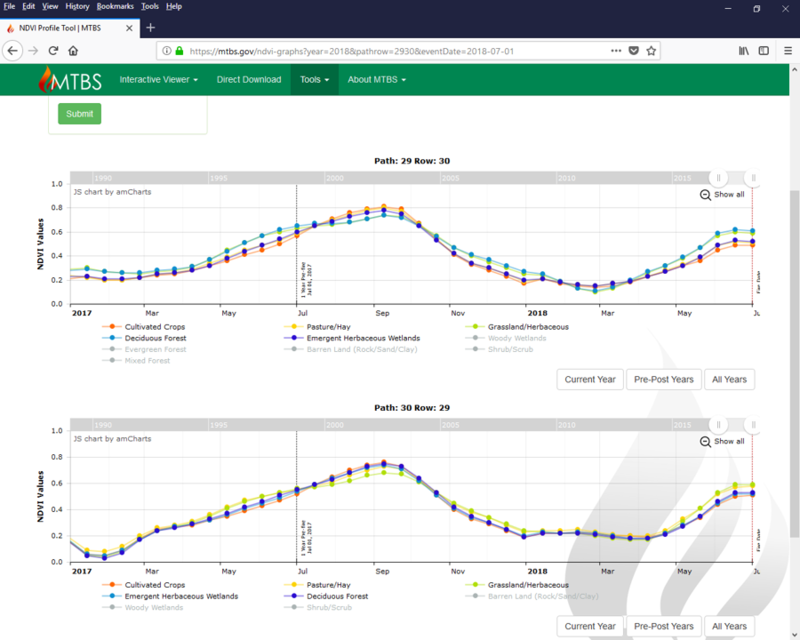 You might want to examine adjacent Path/Rows if you’re determining whether you want to use pixels from overlapping scenes for you event mapping analyses. As you can see, the path/rows have similar NDVI curves suggesting that they could be used together.